Guess Who’s Back – Face it y’all, y’all Rockets playing basic-ball. We’re on the block like we’re eight feet tall. [Friday Afternoon] Yeah, I did it. Guilty as charged, Your Honor. There’s no denying it. Yes, I used a Scarface song against the city of Houston for the Game 3 theme of my San Antonio Spurs blog series. I’m not even sorry about it. Judge, I refer you back to Exhibit D. This powerful piece of evidence shows Houston Rockets fans’ obnoxious, contemptible and clearly premature outpouring of vile overconfidence on social media. While I will certainly apologize directly to Houston’s greatest al-time rapper for my actions, I think (after a careful examination of the facts) it’s plain to see that Rockets fans did this to themselves. The defense rests to await your Game 3 verdict. [Saturday Afternoon] Last night in the Court of Karma, I was found “Not Guilty by Reason of Self-Defense” for using a local treasure against his own city when the San Antonio Spurs went into the Toyota Center in Houston, TX and defeated the Rockets 103-92 to take a 2-1 lead in the Western Conference Semifinals. Home court advantage…regained. In another Only Coach in the League with the Stones to Do It move, Gregg Popovich started rookie point guard Dejounte Murray to replace the injured Tony Parker in the Spurs starting lineup. It’s been nine days shy of fifteen years since the Spurs last started a rookie at point guard in a playoff game. On May 14th, 2002, (you guessed it) Tony Parker made the tenth playoff start of his rookie season in Game 5 of the Western Conference Semifinals against the two-time defending champion Los Angeles Lakers. The Lakers won that game 93-87 to eliminate the Spurs (Tony had 14 points and six assists in the losing effort). Last night, Tony’s heir apparent didn’t do much on the stat sheet (two points and one steal in 14 minutes) but gained some valuable experience that will be important for him and the team moving forward. Interestingly, despite his lack of production, Dejounte had the highest plus/minus on the team (+11) in his 14 minutes of action last night. This is especially surprising considering he had two lackadaisical turnovers bringing the ball up the court (Patrick Beverly straight ripped the ball from him both times). Fortunately, the Rockets only scored three points off of those two turnovers (and zero directly off of the steals) but mistakes like these often make the difference between winning and losing a close playoff game and for that reason are inexcusable. As long as Dejounte can learn from it and concentrate on protecting the ball moving forward, I trust that he is capable of continuing in the new role of San Antonio Spurs staring point guard for the rest of the 2017 NBA playoffs. After all, Pop clearly trusts him enough to make such a high stakes bold move and I learned a long time ago to live by the phrase, “In Pop We Trust.” Tony Parker’s NBA record of 221 consecutive playoff games played may have ended last night but one thing is clear; the San Antonio Spurs 2017 title hopes didn’t end with it. Ladies and gentlemen, welcome to the Dejounte Murray-era. One of the keys to last night’s victory was our ability to carry over the suffocating Back to Black championship-caliber defense that we played in Game 2. The Spurs held the Rockets to 36.4 percent shooting (32-88) and 30.8 percent behind the three point line (12-39) in Game 3. As a result, for the first time since Mike D’Antoni took over as head coach, the Houston Rockets were held under 100 points in consecutive games. Kawhi Leonard and Danny Green put on a “how to” clinic in perimeter defense by repeatedly disrupting Houston’s planned attacked and forcing them into uncharacteristic midrange shots off of the second and third option. One of the noticeable takeaways from Pop’s brilliant defensive game plan was the way that Kawhi and Danny intentionally guarded James Harden with their hands already up during the pick-and-roll (before Harden made his move) in order to minimize the risk of The Bearded One tricking the referees into calling garbage fouls on three point attempts. The tactic paid off as Harden took several ill-advised threes and became increasingly frustrated that the officials were requiring him to play basketball rather than continue his Hollywood acting career. Word of advice to the likely 2017 NBA MVP, you can’t fool the referees into continuing to greenlight your acting projects now that Coach Pop, Danny, and Kawhi have backed out of helping to produce them. Stop treating these playoffs as your personal casting room to audition for the role of Keyser Söze in a remake of The Usual Suspects and use your abundant talent to play the game instead. 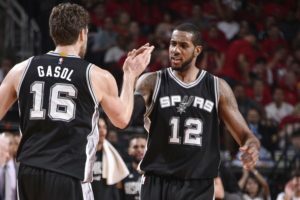 Moving on, the tandem of LaMarcus Aldridge and Pau Gasol were equally impressive to their wing counterparts on the defensive side of the ball. The pair combined for 16 rebounds and six blocked shots (while also disrupting Houston into missing many more of their attempts in the paint). In fact, because their stellar interior defense was backed up on the other end of the court with brilliant post play, Pau and LaMarcus are my two leading candidates for player of the game. Pau takes the runner up spot with 12 points (on 4-8 shooting) and four assists (on some sick interior passing to L.A. and David Lee) to go along with his nine rebounds and two blocks. Had his second-half offensive production kept pace with what he gave us in the first half, Pau might have grabbed his first ever player of the game honor as a member of the Spurs but that will have to wait for now because LaMarcus Aldridge was brilliant for his entire 38 minutes of work last night. As an unwavering defender of the value that this five-time all-star brings to our team (through good times and bad), it brings me great pleasure to declare in no uncertain terms, guess who’s back. LaMarcus Aldridge had his best game of the 2017 playoffs, racking up 26 points (12-20 from the field) and two assists to go with his seven rebounds and four blocked shots. Guess who’s back, indeed. Having just absorbed the devastating blow of losing Tony Parker, it could have not come at a better time. LaMarcus said after the game, “I know without TP, I have to be even better so I was trying to make things happen tonight.” Job well done, LaMarcus. If you can continue to be a dominant second-option for the remainder of these playoffs, not only will the Spurs title hopes not have ended with Tony’s injury, they may vary well begin growing exponentially. Of course, that remains a very big “if” after only the first game of seeing Aldridge return to all-star form. Consistency is the key. If LaMarcus can back it up with another dominant performance tomorrow night, we will have an excellent chance at doing what Houston failed to do in San Antonio: ward off complacency and greedily steal both road games. A 3-1 lead heading home has got to be our mindset for tomorrow night because this series is far from over. The Houston Rockets remain an extremely dangerous opponent. If we allow complacency to set in and fail to bring the same defensive intensity we had in Games 2 & 3, Houston will even this rivalry series and throw the pressure squarely back on us for Game 5. In last year’s Western Conference Semifinals against the Oklahoma City Thunder we were in the exact same situation after three games. With a chance to go up 3-1 and snuff out the Durant-Westbrook tandem once and for all, we failed to bring the necessary focus and instead lost a tough road game in Game 4. It didn’t seem like the end of the world at the time because we still had home court advantage in the series but after losing another brutally close game back at the AT&T Center in Game 5, our season (and Tim Duncan’s career) were over in a Game 6 catastrophe in Oklahoma City before you could blink. We have to learn from last year’s experience and play Game 4 tomorrow night in Houston like it’s an elimination game. Tomorrow night, the #BlackAndSilver have to march right back into the Toyota Center with the mindset of breaking the Rockets’ collective spirit. The San Antonio Spurs have never defeated the Houston Rockets in a playoff series (0-3 all-time). Considering that they are our in-state rival and we pride ourselves on being the NBA’s best franchise, I think it’s high time we start correcting that small blemish on our impressive resume. Indeed, we have history that needs rewriting and that can start by going on the road again tomorrow, playing Spurs basketball and giving the Rockets all we got.